Get ready to bear those shoulders! The strapless gown now has some serious competition with off the shoulder gowns taking over Spring 2017 runways. Plunging necklines and oversized bows were also wedding dress trends seen on ready-to-wear runways. 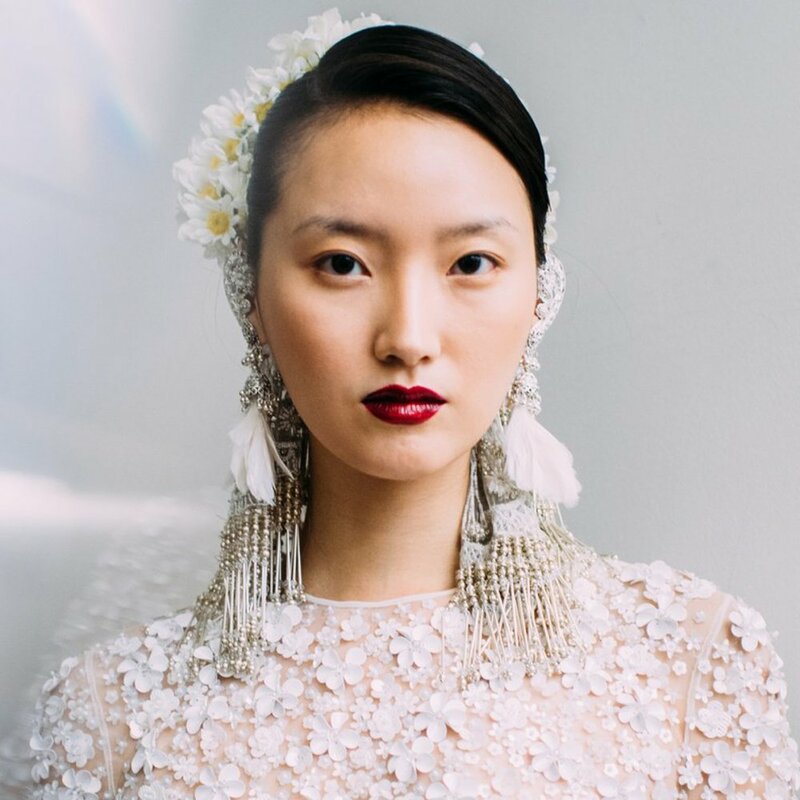 As any designers focused on bold and elegant designs this season ideal for the modern bride, bridal beauty took a soft and natural approach with effortless hair and minimal makeup featured through the Bridal Market 2017 shows. Beach waves and boho style still has its place this season though the looks are slightly more refined and polished, proving that even the most dramatic gowns look best with effortless hair. Tiara's are back! Make sure you pair them with easy effortless hair or sleek pulled back looks. Avoid over accessorizing and allow the Tiara to shine in all its glory! Braids, knots, twists, buns and romantic versions of the classic chignon are the latest updo trends. With brides keeping the attention of the face with the detail of the braids and knots adding drama at the back. Light as tulle veils adorned with fresh flowers graced the Marchesa runways. Veils were also accent with embroidery, lace and beading with trains ranged from a shorter church length to a Royal cathedral style. Marchesa's dreamy dresses were perfectly paired with braided crowns and jewellery to add more dimension and detail to this romantic look. Bridal hair accessories are extremely popular right now with many online stores and Esty designers making trendy wearable and affordable hair accessories. Adding the right embellishment to your hair will often showcase intricate detailing in the hairstyle and can complement other features of your gown and overall look. I highly recommend all my brunette brides to consider adding hair accessories to their bridal hair, as darker hair often does not show fine detail in photos. By adding an accessory you will add contrast and highlight the detail in the hair design.